With an Artist’s Eye: How Can You Design Book Interiors Better? All the talk and collateral in the world won’t matter if your message doesn’t speak to your target audience, especially in our current economic drought. Rarely does everyone at a company say the same thing and seldom do they say it in a compelling manner that reaches customers. Kevin Daum addresses these hurdles with his approach based upon a 3,500 year old secret to success and the inspiration of his latest book ROAR! 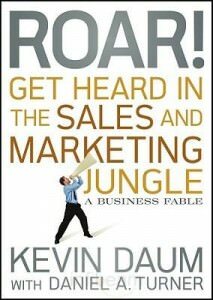 Get Heard in the Sales and Marketing Jungle (Wiley). Whether you’re negotiating a major deal, interviewing for your first job or graduating college, the benefits of ROAR! and pursuing The Awesome Experience are endless. In a charming and motivational manner, Daum has the insight to create ROARing successes in both the professional and personal realm for anyone looking to succeed.